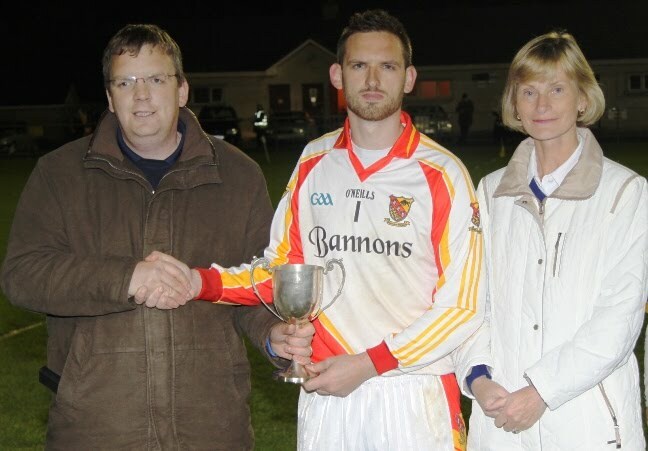 Moycarkey/Borris bridged a twenty-four year gap after seeing off the challenge of Upperchurch/Drombane by a single point in a tense AIB, Thurles sponsored Mid Intermediate Football Final 2012 staged in ideal conditions under the lights of Templetuohy on last Wednesday week. Moycarkey/Borris last won this coveted title in 1988, beat Upperchurch/Drombane in a low scoring round-robin game 0-7 to 0-6, should have been out of sight by half-time but hit 11 of their 15 chances off target and it almost proved costly. Upperchurch/Drombane back-to-back winners in 2008 and 2009, with a little bit more composure in front of goal - especially in the second half - could have easily turned the tables. Moycarkey started strongly putting three chances off target before Kieran Morris finished off a penetrating solo-run by half-back John Kelly in the 5th minute. Moycarkey missed a gilt-edge chance a minute later when a long range pass from Niall Sullivan released Eamon Flanagan, but with the goal at his mercy, rattled his shot off the crossbar and the ball was cleared to safety. Moycarkey added a second point in the 8th minute when Anthony Healy scored from a close range free-kick. Upperchurch, who were winning the majority of breaking balls in the middle of the park, struggled to find a close-in scoring chance against the ‘blanket defending’ by Moycarkey, but after a number of probing attacks, eventually got on the scoreboard in the 9th minute. Colm Ryan collected a pass from fellow midfielder Paul Shanahan and split the posts with a strike from 30 yards. The ‘Church were back on level terms when Tommy Stapleton finished off a cross-field pass from Padraig Greene in the 13th minute and Paul Shanahan put the ‘Church ahead for the only time in the 16th minute when he finished off a pass from Tommy Stapleton. Meanwhile, Moycarkey whose wide count was continuing to rise to the dismay of their supporters, restored parity in the 20th minute when their most influential player Rory Ryan cut through the ‘Church rearguard before kicking the ball between the posts. Moycarkey regained the upper hand, but a combination of a goal-line clearance and wayward shooting kept the ‘Church hopes alive. However, with the last attack of the opening half Moycarkey regained the lead at 0-4 to 0-3 with a Kieran Morris score following a quick inter-change with Rory Ryan. Both teams made changes at the break with Conor Hayes and Pat Molloy coming on for Moycarkey and L J Ryan and Paudie Stapleton introduced for Upperchurch. In the 33rd minute Moycarkey went two points clear when a quickly taken free-kick by Rory Ryan saw substitute Conor Hayes score with his first touch. Upperchurch were picking up the bad habit of Moycarkey with some wayward shooting, before a free-kick in the 42nd minute from Colm Stapleton reduced the deficit to a single score once again. Upperchurch were now winning the 50/50 exchanges but saw an effort by Paul Ryan come back off a post and then a minute later missed a gilt edge chance when Michael Ryan from just a few feet out poked the ball wide of an unguarded goal. That let-off saw Moycarkey regroup and once again put two points between the sides in the 45th minute. A brilliant reflex save from ‘Church goalie David Carey from Anthony Healy pushing the ball around the post for a ‘45’. From the resultant placed ball, Paul Dempsey scored to make it 0-6 to 0-4. Once again Upperchurch were allowed back into the game. The ‘Church, who introduced Owen Shortt in the 50th minute proved inspirational, helping to bring the sides level. Shortt was fouled with his first touch and that indiscretion was punished with another Colm Stapleton free-kick. Shortt then levelled it at 0-6 apiece after 52 minutes to set-up a nail-biting finale. With the stopwatch heading towards full-time either side could have clinched victory. Upperchurch were denied by Moycarkey’s John Kelly producing a great block on Owen Shortt as he was about to pull the trigger followed by an effort from Padraig Greene going inches wide when well placed. Instead, it was a Moycarkey side that could afford the luxury of missing 16 of their 23 attempts on goal, snatched a very fortuitous victory when a well-struck winning point by County All-Ireland Intermediate Hurling star Kieran Morris from 30 odd yards out in the 58th minute ended that twenty-four year famine.